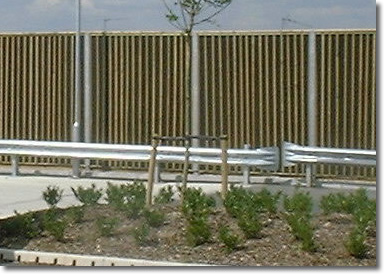 The Metafence Reflective Acoustic Barrier has evolved from the Berkshire Fencing and the Betta Group Reflective Noise Barriers; the Berkshire Reflective Barrier was one of the first to be designed for and approved by the Department of Transport in the 1970's. The Metafence Absorptive Acoustic Barrier has evolved from the one designed by the Betta Group and retains the principals of design flexibility with affordability. The Reflective and Absorptive Barriers both use the principal of steel universal beams with stress graded timber rails fixed through the web of the posts. This gives an easy flexibility for designing and building to any height, slope, step or differing top and bottom datum levels. The construction also allows different materials to be used on either face of the absorptive barrier. The Barriers are based on the Department of Transport Memorandum H14/76 including Amendment No. 1 and the more recent Highway Agencies HA 65/94 part 1 'Design Guide for Environmental Barriers' and HA 66/95 Part 2 Volume 10 'Environment Design'. The timber and steel components comply with the Specification for Highway Works (MCHW1) clauses 304, 310 and 311, these systems offer a 15 and 30 year life expectancy. As with all Acoustic / Noise Environmental Barriers, they work on the principal of providing as large as an acoustic shadow as possible and therefore for maximum noise reduction barriers should be as long, as high and as close to the noise source or receiver as possible. The Metafence Reflective Barrier offers an economic solution to a noise nuisance when reflective noise can disperse without causing an increased noise nuisance to others. The mass of the barriers structure acts to reduce the amount of sound that is able to pass through it. 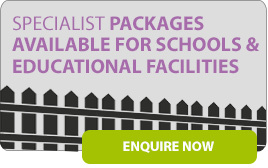 The barrier is built from construction grade tanalised timber with a green or brown tint and galvanised posts that may be polyester powder coated to any RAL colour or timber clad. The Metafence Absorptive Barrier is important in applications where sound bounces back from reflective surfaces, so increasing the noise nuisance to neighbours. The Barriers consist of sound absorbing material with a solid backing and a 40 - 45% open aperture to the front face. The front may consist of a black membrane, fine black weldmesh and PAR timber trims to soften the appearance or perforated steel sheets finished to the clients' requirements. The back face may be tanalised timber, profiled steel sheets or a combination of both. Security topping or earth retaining features may be included in both Reflective and Absorptive barrier designs. The Company is able to interpret and design to Sound Consultants specifications or comply with planning reports on noise reduction or environmental impact. Metafence offer a design, supply and installation service for both the Absorptive and Reflective Acoustic Barriers throughout the UK mainland. The Company have the ability to design and manufacture to suit most height and ground conditions, including tapering to suit differing heights and ground levels.